Do low-energy buildings have an overheating problem? In this blog post I take a quick look at the physics behind summer overheating problems and unpack claims that high levels of insulation make the problem worse or more likely. New homes, even those built merely to building regulations standard (otherwise known as the worst performing home you can legally build) are much better insulated and much more airtight than the vast majority of homes built in the past. Homes built to Passive House standard are even better insulated, and radically more airtight. It is sometimes claimed that all this attention on improving the winter performance of homes is causing them to overheat more often, or more severely, than the leaky homes of old. On the face of it this seems obvious – in the winter you put on warm clothing to stay warm, but do the same on a warm summer’s day and you’ll get too hot. Indeed, that is the slant taken the Daily Mail (so it must be true!) in this article. It’s not quite so simple as this, but the claims are not completely unfounded either. Let’s take a quick look at the physics involved. Insulation and airtightness are good at slowing the flow of heat from a warm place to a cold one. In winter this means that a well-insulated, airtight home needs less heating to maintain a comfortable temperature than a poorly-insulated, leaky home. The insulation is slowing the flow of heat from the warm inside of the house to the cold outside. The same is true of a warm coat on a cold day, it is slowing the flow of heat from your body to the cold outside world, meaning you need to burn less energy in order to stay warm. The warm-coat analogy doesn’t work so well in summer. UK temperatures during hot weather reach the high 20s, and occasionally the low 30s, which is still below the temperature of your body. The insulation in a coat is no longer useful when we are trying to stay cool because, unlike in winter, we want the heat flow from our body to the outside world to be high. Conversely, temperatures in a house should be in the low-to-mid 20s, which is below temperatures experienced outside during heatwaves. The heat flow should be in the opposite direction to our ‘warm jumper’ example. In these conditions insulation and air-tightness will slow the rate of heat flow from the hot outside to the cool inside, which is exactly what we want. Just as a thermos flask can keep a drink hot by slowing the rate of heat flow from inside to outside, it can also keep a drink cool by slowing the rate of heat flow in the other direction. But houses are not thermos flasks and very well insulated homes do sometimes overheat. They sometimes overheat very badly. Why? A house on a hot day gains heat from several sources, some from inside the house (appliance use, hot water use and storage, body heat) and some from outside the house (conduction through the walls/floor/roof from the warm outside or from sun-heated surfaces of walls and roofs, ventilation/infiltration bringing warm air in and the sun shining through the windows). Insulation and air-tightness help to reduce the gains shown in bold but do nothing to reduce the others1. If these heat gains are high enough, for example on a sunny day in a house with lots of glazing, then a house can become warmer than the outdoor air temperature. When that happens insulation and air-tightness go from being your friend (keeping the heat out) to being your foe (keeping the heat in). A house that is gaining heat much more quickly than it is losing it will warm up until the gains match the losses (heat losses increase as the difference in temperature between inside and outside increases). We call this the equilibrium temperature. In a poorly insulated, leaky house the equilibrium temperature will never be very much higher than the outside temperature because there is so little to stop the heat flowing out of the house. In a very well insulated house the equilibrium temperature can be much higher since it is so well insulated and air-tight. It takes a big temperature difference for the heat losses to match the heat gains. We are back to our warm-coat analogy. To illustrate this I built a simple model using DesignBuilder – a dynamic simulation tool that allows us to model the performance of a building over time. My model was a simple 10 m by 5 m medium-weight building in London. I made four versions of the model. The first two were deliberately designed to overheat – with large (80% of the wall area), unshaded glazing on the south aspect and no attempt to reduce internal gains and no window opening. One of these versions was constructed to represent a ‘typical’ existing building (100mm insulation in the loft, no insulation in the walls or floor, basic double glazing, poor air-tightness), the other was constructed to represent a building with Passive House levels of insulation, glazing and airtightness (although not a Passive House standard building, since in order to reach the standard summer comfort criteria must be met2). They were both simulated during two weeks of very hot summer weather. The thin blue line shows the external air temperature and can be seen to be reaching above 30°C on three of the days (peaks are daytime temperatures, troughs are nighttime). The black line shows the operative temperature3 for the typical existing building, which looks pretty uncomfortable; almost always above the outdoor air temperature and reaching a maximum temperature of 35°C. But the model with Passive House standards of insulation and air-tightness (the green line) is much worse; above 38°C for the whole period and reaching a peak of 46°C. So in a really poorly designed building, one in which the designer has given no thought to overheating at all, and in which the occupants don’t think to, or can’t (security, noise, midges) open the windows to cool off, insulation and air-tightness can indeed make overheating much more severe. Buildings with big, unshaded glazing facing south, east or west are surprisingly common. Insulating and sealing buildings to current building regulations will cause these buildings to have severe a overheating problem (yes, even in Scotland!). Putting in Passive House levels of insulation and air-tightness, without taking other measures to reduce the overheating risk, will make them the problem worse still. But it doesn’t have to be like this. By designing our buildings carefully, thinking about summer comfort as well as winter comfort, we can move away from our ‘warm jumper’ analogy and back to our ‘thermos flask’ one. For the next two models I reduced the size of the southern glazing to 30% of the wall area, added a 1m deep overhang above the window, reduced the gains from appliances by 30%, the gains from lighting by 50% (equivalent to switching to LEDs from old style ‘low energy’ CFL lighting) and allowed windows to open during the night time. The temperatures, over the same week of weather, for the two improved models are shown below. Note that the scale has changed from the previous graph. 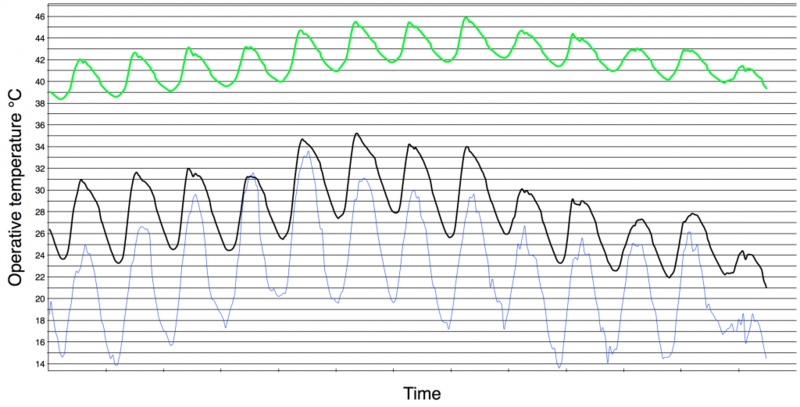 The measures I’ve taken to reduce overheating are effective for both the poorly-insulated and the well-insulated buildings, with peak internal temperatures (black line for the poorly insulated building, green line for the well insulated building) now being below peak external temperatures (thin blue line) for both buildings. 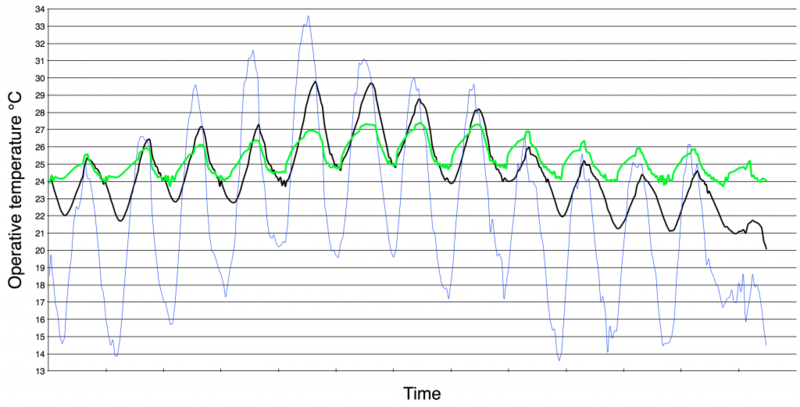 But the improvement is much bigger for the well-insulated building (green line), which now is experiencing peak temperatures more than 2°C lower than those of the poorly insulated building. The equilibrium temperature in the middle of the day for the well insulated building is still much higher than for the poorly insulated one, but because the building is gaining heat so slowly it doesn’t get near to it before cooler night-time temperatures arrive and the building can cool down once more. In summary it is possible to design low-energy buildings that perform better in winter and in summer, through careful attention reduction of summer heat gains, but current building regulations do not do enough to ensure this. If you are in the process of having a home built for you, or thinking of it, ask your architect/designer about overheating. If you get the impression they haven’t thought very much about it then be concerned and seek expert advice. I’d say this even if your house is being built ‘only’ to current building regulations. The Passive House standard includes a criterion for overheating. I’d recommend trying to do much more than merely just meeting those criteria. Low-energy buildings that are robust to summer overheating risk will become increasingly important as our climate warms. The modelling I’ve done here was quick and approximate, merely to illustrate the point. Further improvements in the summer performance of the highly insulated building could have been made. Internal heat gains could have been reduced further still (by specifying all A+++ rated appliances, daylight/occupancy control on the lighting and a well designed hot water system), and a smart ‘summer bypass’ mode could have been implemented on the heat recovery ventilation (MVHR) so that cool air would be ventilated into the house when the outdoor air temperature was low but that the heat recovery would still work to keep the cool in during the hotter periods. All of these things would be a good idea in the real world, and would further increase the summer performance advantage shown by the well-insulated building. In fact triple glazed windows also reduce solar gains a little, but I’ve ignored this here for simplicity’s sake. Operative temperature is the average of the air temperature and internal surface temperatures. See my previous blog for why I use this to measure comfort instead of air temperature.